Struggle to remember your shopping bags? This little chap will snap at your ankles should you forget him! Once again we’ve captured the best side of the Fortnum’s famous lobster (as seen on The Fortnum’s Cook Book). This canvas shopper bag is pleasantly roomy and structured enough to hold plenty of ingredients. Dimensions: 38cm (W) x 40cm (H) x 10cm (D). 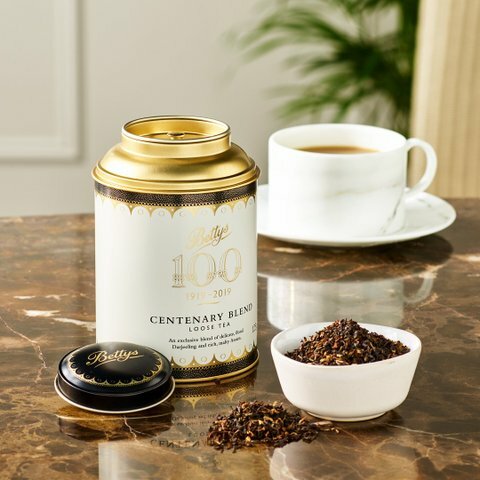 This special Royal Exchange Tea has been specially created for the launch of our new store at the Royal Exchange. This refreshing blend is similar to our Royal blend with the very special addition of Yunnan Golden Buds. These Yunnan buds have added a subtle smoky flavour to this tea with the maltiness from Assam of our Royal Blend. The Yunnan Buds have been included not only for their delicious flavour but for a historical nod to The Great Fire of London that destroyed the Exchange building during the 17th Century and a later fire in the 19th Century. The special tin design has drawn inspiration from the Gresham family crest and the building itself, including the golden grasshopper you can see on the roof of the building, is present on the side of the tin. This tea is the perfect blend to be taken in the morning. The all-spinning, all-singing queen of biscuit tins. Decorated with a glorious cast of characters and filled with some of our favourite biscuits flavours, this keepsake tin is a feast for the eyes, as well as the taste buds. Featuring the fruity and sweet Shrewsbury Shortcake biscuit, the crumbly and rich Triple Chocolate biscuit and the crisp and citrusy Lemon biscuit half coated in Dark Chocolate. Tin Dimensions: 17cm(H) x 17cm(W) x 17cm(D).